Bassist, Alison Rayner has been a mainstay on the British jazz scene for many years, initially coming to my attention in the all female Latin jazz group, The guest Stars , in the 1980's.. Along with guitarist, Deirdre Cartwright she co-runs a record label and jazz club under the banner of Blow The Fuse, bringing valuable opportunities to play for many musicians over the years and of course refining her own considerable talents. "I played a number of instruments from an early age - ukulele, guitar and piano - played in a band at school and also sang in choirs", recalls Alison. "In the mid 70s, desperate to be in a band again, I managed to inveigle my way into what would become Jam Today, a feminist rock band. We needed a bass player - I thought 'I could do that'! Gradually the rock became tinged with jazz-rock and I discovered bands like Weather Report, Chick Corea and Pat Metheny. I had a nice Fender Precision but, influenced by Jaco Pastorius, soon bought a beautiful fretless Fender Jazz. I actually played fretless exclusively through the 80s Guest Stars years (had a great Wal Custom fretless made) and listened to more and more jazz. Finally, in the late 80s, I had an opportunity (through writer and photographer Val Wilmer) to buy the beautiful acoustic bass that I still play now." 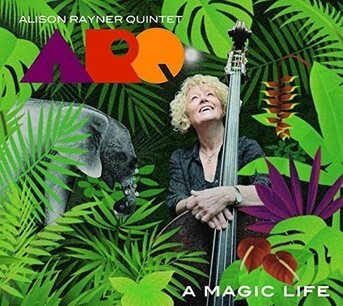 And it is that beautiful acoustic bass that we get to hear on her new recording A Magic Life by the Alison Rayner Quintet which was released last autumn, and now being followed up with a Spring 2017 tour of the UK. "I was at a friend's funeral last year; and knowing of her approaching death she had been able to plan her funeral - and wrote an epitaph, where she referred to having had 'a magic life'. I thought that was an amazing thing to feel about your life - and indeed to say" she explains. "Not long after, I was examining a young Polish boy doing a grade 4 guitar exam who, out of the blue, asked me 'Is music stronger than magic?' I was a bit stunned by the question - rather profound, I thought - and replied that to me, music is a merging of magic and logic. The conversation stayed with me and the two events set me on a course of thinking about connections between memory, mortality, magic – and music. Hence the piece, and then the album." So was all the music was written especially for the recording, "Yes definitely" Alison replies. "My first album August, released in 2014 was almost a retrospective of my writing to date - comprised of pieces written for bands I was in, from the early 90s right up until the album recording. Once we were touring August, I started to bring in new pieces to the group and it became apparent that a new album was being developed. Everything on the new album was written in just over a year and yes, effectively it was all written especially for it. I also asked the other band members this time if they would like to contribute a piece and Steve (Lodder) and Diane (McLoughlin) both produced wonderful compositions." Continuing, Rayner adds, "To me, the new album has a more focused, cohesive feel to it with themes and ideas being strongly developed. Some different musical influences have also started to play a part in my writing than on our first ARQ album – for example: my love of late Classical/Romantic melody and drama and folk song themes - including Celtic melodies (my Scottish mother's family originated in the Shetlands). I love writing, albeit it feeling, at times, a bit scary. What if I run out of ideas? Grooves have always been hugely important to me but I feel I'm much better at developing melodies now, and can go somewhere else with them. I have more confidence in taking risks and my vision for the band is clearer. I have also focused more on pieces that reflect memories and emotions this time and this is of course fits the album’s overall theme." One of the major factors in the remarkable development of ARQ between recordings is the fact that the band has retained a stable personal, as Alison is quick to point out. "At the start, I knew I wanted a quintet with the option of different front line voices and harmonies. I write on piano and like the sax/guitar sound very much. I wanted that wonderful mix of great players and people who I really like - supportive, relaxed, team players - and no divas! Everyone in the band is also a band leader and so really appreciate what it's like for me. They are inspiring, great sympaticos and fun company. I really enjoy writing with these players in mind", she says with no little enthusiasm. "I can imagine what I want them to play - but also know that their contributions will be invaluable. They are all fantastic musicians and understand what I am after. Collaboration with them is always positive: they suggest alternatives at times to enhance pieces whether it be a change in the arrangement or a different chord voicing. I have known Diane since the late 80s and love her sound and the depth that she brings to the music. She plays with soul and passion, has a tremendous understanding of harmony, along with a great ear. I have admired Steve's playing since I first encountered him about 25 years ago. I love his fluidity, extraordinary technique and musicality. He was my first choice for piano. I met Buster when he was my assistant tutor on what was the Glamorgan Jazz Summer School some time in the 90s. We hit it off straight away and I loved his playing and openness. He now runs the course with Dave Wickens, is an in-demand player and is my favourite drummer to work with." As well as focussing on her quintet, the bassist is much in demand to play in the bands of others. "I work with a number of other artists, particularly vocalist Carol Grimes, trumpeter Chris Hodgkins, US based singer-songwriter Zoe Lewis and I am also part of Koral Society, an acoustic world trio led by songwriter Caroline Trettine and featuring Mosi Conde on kora. We have an album release and tour coming up this spring." In addition to performing, Alison also finds the time and energy to co-run a a venue, "I run Blow the Fuse with Deirdre Cartwright and this involves club nights, our record label and other promotional projects. We also run a couple of bands to play at parties and functions - all our work comes by word of mouth and they are really fun groups to play in. I have known Deidre for many year, we met in the mid 70s in Jam Today, an all women rock band. It was a time of political upheaval and musical shifts - punk, the beginnings of jazz-rock. I had just started playing bass guitar and Deirdre was already a pretty proficient guitarist. We didn't initially get along (I was rather political and she was rather loud...) but in time a great friendship and working relationship was formed. We played together in the Guest Stars through the 80s and then started Blow the Fuse in 1989 after that group ended. I've played in all of her groups and we're used to working around each other - in both leading and supporting roles - and across a wide variety of musical styles." Warming to her subject, Rayner elaborates, "We started Blow the Fuse in 1989 after I saw Mike Stern playing in the 55 Bar in Greenwich Village. I was struck that whilst he was booked for big concert halls and festivals, he would still play two or three times a week in a local club when he was at home. The Guest Stars had ended and Deirdre and I both wanted to play – we thought we’d start a regular gig and ask people to play with us. Genius! "Over the years we have programmed endless club nights – at the Vortex and a number of other North and East London venues. We also promote larger scale events – the Stoke Newington Festival jazz stage for several years, gigs at Stoke Newington Town Hall and the Old Church, the Ocean in Hackney, London Jazz Festival etc. Artists have ranged from established musicians such as Peter King, the Westbrooks, Ian Shaw and Jean Toussaint to newer, emerging players – particularly in our Tomorrow the Moon seasons over the past five years. We have featured groups led by Lauren Kinsella, Laura Jurd, Yazz Ahmed, Camilla George, Nubya Garcia and many other younger women through this project. It’s been a great way to increase the diversity of musicians – and audiences of course – and to all keep in touch with what’s going on across the generations! Blow the Fuse also naturally became a record label and my recent ARQ album Magic Life is our thirteenth release." With the release of Alison Rayner has now reached that period of her career whereby dues have been paid, and perhaps now more than at any other time we get to he the real musician behind the double bass. Her playing is full of elegance and a tone on the instrument that is forceful enough to be heard, yet always contributing to the overall group sound. When asked about her influences as a bass player she replies, "They are varied, to say the least! I heard an eclectic range of music at home - classical music, show songs, folk and some jazz. I became obsessed with pop and rock music from my early teens - listening to pirate stations like Radio Luxembourg and Caroline. Lots of 60s rock and soul music, which I still love, then 70s funk and African and Latin music in the 80s. This varied mix stays with me and emerges in my playing and writing. As for bass players Charlie Haden, Scott la Faro, Eberhard Weber, James Jamerson, Jaco Pastorius, Jimmy Blanton, too many to mention. I love groove players; bass is so much about making other people feel good and play well." And plans for the future? "At the moment, my plans are really about ARQ. We are continuing our new album promotion this year - regional touring through March and April, then further dates in June and November. I intend to focus, in the next year or two, on festivals and getting more work in Europe. That's as far as I'm thinking right now - life has taught me that you never know what's around the corner." For more information and tour dates visit blowthefuse.com. Click on the album to cover to read our review of A Magic Life.